A metal thief hid for five hours in an air duct at a disused hospital in Devon from what he thought was police, only to find out it was another thief. 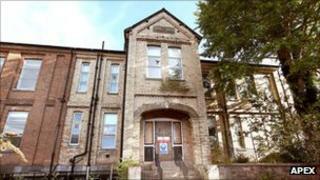 The two men, one aged 30 and a 19-year-old, were found at the former Tiverton District Hospital in Bampton Street. They were arrested after police and the force helicopter were called to the site after strange noises were heard. They have been released on police bail until 27 October pending further enquiries. Police were called to the site just before midnight following a 999 call. The 10 officers were supported by a police dog and the helicopter. A police spokesman said: "In a bizarre twist it appears that neither male knew that the other was there. "Prior to police arrival, one of the males hid in ducting for five hours thinking that the other male was the police searching for him." The man in the duct was located by the police dog, while the helicopter traced the other male on the roof. Insp Andy Oliver, from Devon and Cornwall Police, added: "The site is quite dangerous and with the price of metal being high this shows the risks some people are prepared to take."